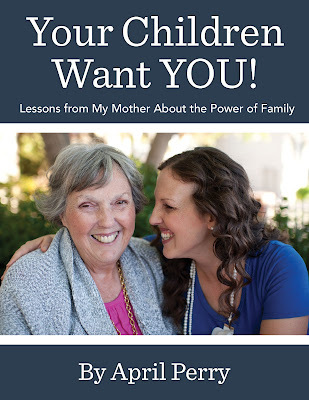 Power of a Family: Book Launch Day! Your Children Want YOU! Book Launch Day! Your Children Want YOU! You have been with me on this journey with my mom for years, and I can't thank you enough for your continual love and support. Today is an exciting day. Your Children Want YOU! is ready. We have a special launch price available through Friday night--Buy the eBook for $12 and get the audio book free! Whew! I'm so glad I found your blog...a place to send you a quick message. I just want to say "Thank You" from the bottom of my heart. Lately I feel like a TOTAL FAILURE as a mother. I see where I am and where I want to be and the gulf between the two is ever widening. I am not the "happy, fun" mom I want to be. (Yet, I hope. Hopefully I'll get there). I yell. I have a temper problem. I can be downright awful and it kills me each time. But last night two powerful things happened for me: 1- I listened to your podcast that I felt was made JUST FOR ME about "You are Not FAILING". (No words to describe how you hit the nail on the head of everything I'm feeling. I now don't feel like maybe I'm the crazy one, but that others feel it, too!) and 2- I got notification about your book release and the free audio chapters and I Listened to most of them last night as I cleaned the dishes alone late into the night. I cried. I felt so inspired and awed that motherhood really exists in the way you describe your mother to have done it. I was amazed. As a result of listening to your words, today I felt like I had a paradigm shift in my mothering attitude. I tried to keep the sound of your voice that I heard from the chapters in the front of my mind so that every time I felt like yelling today, instead I tried to speak more softly and lovingly like the way you did in your book. It may sound simple or silly, but IT MADE A DIFFERENCE IN MY LIFE TODAY. Your work made a HUGE impact on me! Tears are streaming out of my eyes as I sit here writing this, even. I cannot thank you enough for your work and for this new source of inspiration that I so desperately needed. And the audio chapters are a serious life saver for me, as I never find time to read. But oh, do I spend a lot of time washing dishes. (No dishwasher). I don't know what else to say but THANK YOU, and you have made a real difference in at least one life and one family! Now I'm off to do the dishes again and listen to more chapters. May God bless you in rich abundance for your powerful work and effect in the lives of women everywhere. April, I read your book in one evening. I cried and cried. What a beautiful message, it felt like you were writing directly to me. Thank you for sharing this with the world. I got motivated from you and tried to build a site based on best baby cribs Can you recommend my site to others.